When you give large gifts of money to friends or family, the government wants to know about it, and you must report it on your taxes. 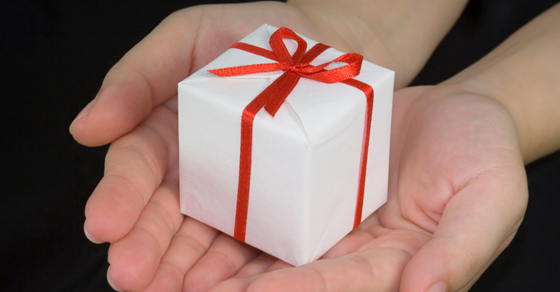 There is a limit, or exclusion–an amount that the government will allow you to gift to a person per year, without incurring tax consequences. The limit is $14,000 per person per year. For example, George and Mary Bailey want to give their four children money for Christmas, which they will put in investment accounts for them. George can give each of his children $14,000 each, a total of $56,000. Mary can combine her $14,000 with George’s gifts, meaning the Baileys together can gift $28,000 to each child without exceeding the gift exclusion tax limit (since in the government’s eyes George gifted $14,000 per child and Mary gifted $14,000 per child). If you do the math, George and Mary can give a total of $112,000 to their children without incurring extra taxes. If they give more than this amount, they will need to fill out IRS form 709 and potentially pay taxes. At the least, they will start using up their lifetime estate tax exclusion.